Both groups strive to fuse their voices to deliver melodic and harmonious messages that are aimed at uplifting and healing souls all around the world. 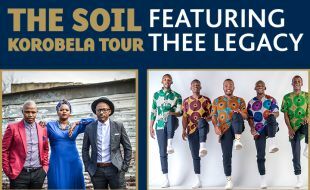 Singing without any instruments, both groups deliver urban contemporary sound and afro-rhythms deeply influence by South African heritage. This is a show not to be missed. They will perform music from their previous albums, introduce their new singles and also collaborate on a few Love standard songs.